For a long time I was a running luddite. My training tools were perceived exertion and at most a stop watch, sometimes I simply checked the clock before I left and on my return; I only touched technology to find out how far I’d run – resorting to Google Maps to estimate distance. That changed with a Christmas gift of a Garmin FR60, enabling me to record training statistics in a similar fashion to cycling. But I was resistant and would often neglect the heart rate strap, it wasn’t like I looked at this information while running. The collection of data was sporadic and incomplete; even when I upgraded to a Garmin 610 on my last trip to the US, I still tended to leave that heart rate strap behind. 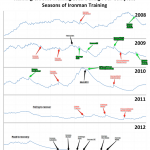 Predictably, once I’d finished playing with my four years of cycling data, I turned back to running. Every run has been recorded, but those luddite ways limit the depth of information, where cycling is data rich, running is impoverished. 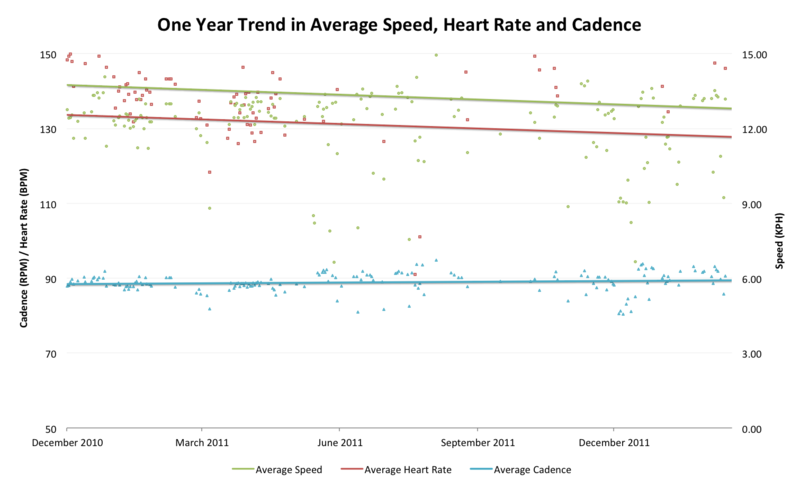 Duration and a rough estimate of speed stretch back four years, cadence is present for most of the last two, heart rate only occasionally crops up. I was keen to apply the same analysis I had just performed on cycling, but this was tempered by the awareness I probably had less than a year of rich data to use. My expectations were low. The last year holds the highest quality of data, so for the purposes of the charts I focussed on this. Even then the sparsity of heart rate data in comparison to speed is notable, in this regard I seem set in my ways. 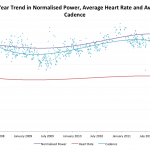 Cadence is consistent throughout the period, hovering on average just below 90; speed and heart rate have apparently fallen over the year, something to be concerned about? At least until I remember that each point on the chart is an average, the downwards trend in run speed is a product of what I’m labelling the ‘Girlfriend Effect’ – regularly training with my partner at a slower pace has pulled the trend line down. I’m not concerned, a second cluster of solo runs shows me holding a comparable pace to last year; I’m happy to be building from that point. With a reasonable correlation between speed and heart rate, this has fallen on average too. It’s unfair to place all the blame on my partner, such a small data set using per session averages is bound to be susceptible to outliers. The problem is highlighted by a group of runs averaging below 9kph, these seemingly pedestrian efforts will have actually contained some of my fastest running of the season. A single average speed makes a poor representation of interval sessions involving strength or technique work during the recovery; 5 minutes of hard running followed by 3 minutes of static activity will register as slow. And of course I can’t discard the fact that just as for cycling, speed is a poor metric of performance, highly dependent on external factors. 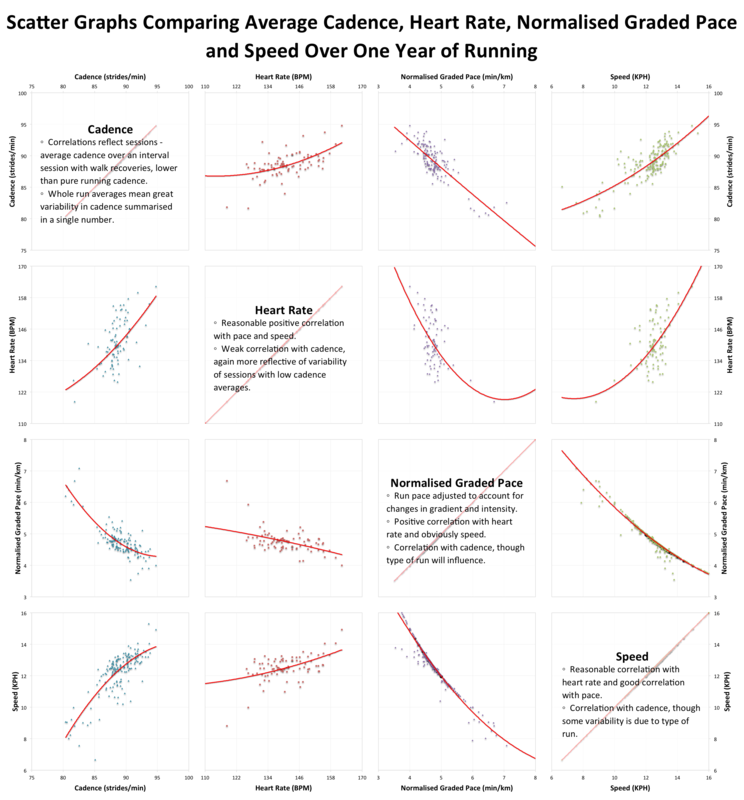 So when I plotted the scatter graphs to look at correlations I also incorporated Normalised Graded Pace, a concept similar to normalised power, attempting to adjust pace to account for terrain and better represent the effort involved. 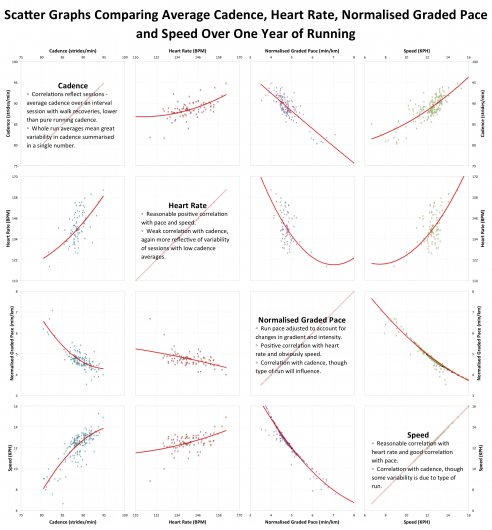 Having identified some of the difficulties with averages in my run data I didn’t anticipate many useful correlations. What is there, is what you might expect – a relationship between heart rate and speed or pace, run faster and your heart rate will rise. There is also a relationship between cadence and pace with faster running tending to be related to slightly higher cadence. It’s small and at the other end of the scale those interval sessions come into play, when I’m stopped between reps average cadence is rapidly pulled down. That said it feels easier to hold a high cadence when running fast, those ‘Girlfriend Runs’ have challenged me to maintain stride rate at a much lower effort. This was more an exercise in completion, matching the work I’d done with the cycling data and in the process highlighting many of the limitations in both analyses. It did confirm my sense that cadence is solidly ingrained and select workouts aside my pace remains similar to last year; given the level and quality of winter training I’m happy with that, for now. And it comes with an unintended consequence – I’ll be wearing my heart rate strap from now on, just for completeness. A repetition of this analysis another year on should be much more detailed and precise. I’ve spent enough time digging through history for now, I’m putting the data to rest. There’s more I’d like to do, I’ve pondered the idea of building a database of raw session logs and looked into developing new charts using R. Projects for the future, it’s time I focussed on data production.